Time and time again, as chimney sweeps we come across soot acid erosion. But what is it? Soot has acid which eats away at the chimney or liner. If you have a stainless steel liner, the impact of this is holes developing in the liner. It doesn’t happen over night, but gradually the acid weakens the steel and breaches are formed. When the liner gets to this point of degradation, it will require removing and replacing. If you don’t have a liner, you may be thinking you can get away with not worrying about soot acid erosion. I’m afraid you’d be wrong. In unlined flues, the soot lines the inside of flue and typically sits on the pargetting. Most houses built in Victorian times had the chimney constructed of house bricks that were lined with a lime mortar pargetting. The acid in the soot slowly eats away at the pargetting (which is what can come down when a chimney is swept) and starts to reveal the house bricks underneath. The acid then works it’s way to the cement holding the house bricks together and slowly but surely, the cement disintegrates. This is why you’ll sometimes get dust falling down your chimney. But this is also how smoke leaks from one flue to another and you smell smoke in upstairs bedrooms. Why does it damage the mid-feathers? 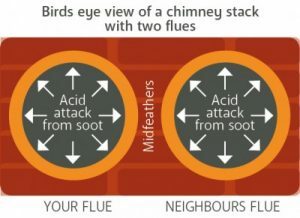 The diagram below, shows two flues within one chimney stack. 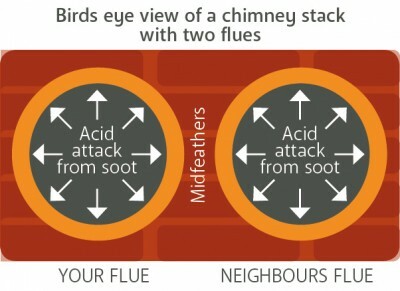 The mid feathers are the wall of bricks in the middle of the two flues which separate them. Typically, the mid feathers are only one brick deep. When victorian houses were built, both flues would have been utilised and therefore soot will be present in both flues. This means the one layer of mid-feathers will be attacked from the soot acid erosion on both sides. Speeding up the rate of deterioration. Why is smoke leakage an issue? This may seem obvious, but this is a question that crops up. If smoke is leaking from your downstairs flue into your upstairs flue, then it will be leaking into the bedroom and usually this is a child’s room. Children are more susceptible to carbon monoxide and dioxide poisoning and therefore even minimal exposure to it can cause issues.